Is Pwani Mchangani a beach? Seems more like where heaven and earth meet. When other waters I described as magical blue, it feels like I lied. “Hakuna Matata” is their mantra and the way they say hi! To go on safari in Kenya or Tanzania, I was too broke. And on Pwani Mchangani, I met the famous Masai tribe. It wasn’t the culture I imagined, but it is real life all the same. And for these Masai folk, tourism on Zanzibar’s beaches gives. Spotting sea urchins, sword fish and starfish so near. I lie in the shade in a poetic daze. The longer you spend on it, the more sorrows you forget. Life wasn’t easy but its magic didn’t fade. 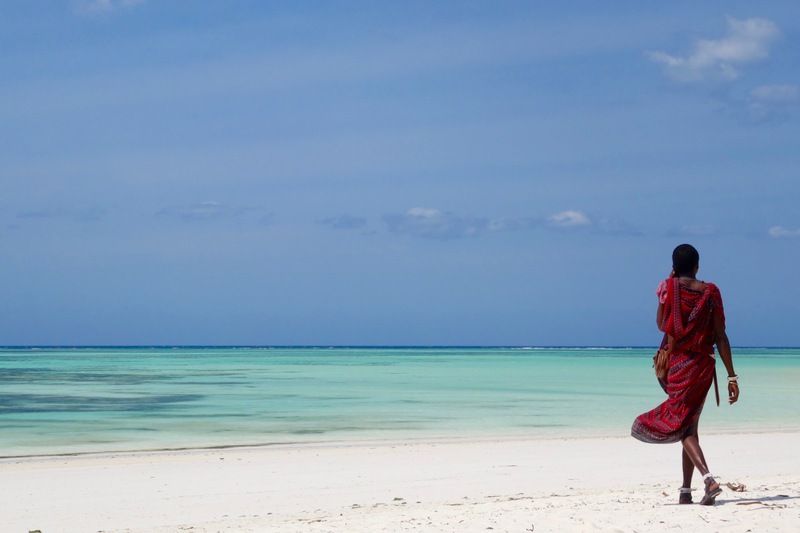 Zanzibar’s most beautiful beach? On the east coast of Zanzibar, Pwani Mchangani is one of Zanzibar’s longest white sand beaches, and pretty much devoid of the tourist paraphernalia that lines the shore of most other beaches on the island. During low tide, the water recedes, revealing miles of soft, shimmering white sands, and up to the horizon, gorgeous shades of blue. I’ve never seen anything like it, not even in Seychelles, Mauritius or the Caribbean! How to reach Pwani Mchangani: I flew in to Zanzibar on Ethiopian Airlines, from Addis Ababa via Djibouti and Kenya. Choose a seat on the right side for a spectacular view over Mount Kilimanjaro (see my photo above)! From Zanzibar airport, Pwani Mchangani is about a 1 hour drive and costs US$ 50 for a private taxi. Currency & Conversion: The local currency in Zanzibar is the Tanzanian Shilling; the exchange rate is roughly 1 US$ = 2200 shillings, or 1 INR = 32 shillings. Most places accept US$, but it works out a bit cheaper if you convert money and pay in shillings. Where to stay in Pwani Mchangani, Zanzibar: I loved staying at Moonshine Villa, a beautiful B&B run by a friendly Italian guy who has lived in Zanzibar for a long time. It is aesthetically built, offers bicycle rentals, an airy lounge area and is a 2 minute walk to the Pwani Mchangani beach. At INR 6,600 (US$ 100), it is way more affordable and homely than a fancy beach resort. Food in Zanzibar: Considering Zanzibar was once called ‘spice island’, the food on the island was a bit disappointing. For starters, Italian food is more readily available than local Zanzibari cuisine – the best meals I had were pastas (including a vegan pesto pasta) at Moonshine Villa. The local food we tried – at Pwani Mchangani as well as in Stonetown – wasn’t as flavorful as I had expected. Language and useful phrases in Zanzibar: The local language in Zanzibar is Swahili, but most people associated with tourism speak a bit of English. Locals tend to greet outsiders with Hakuna Matata (Swahili for no problem), but it’s more of a Lion King thing! Two good words to know are Asante (Swahili for thank you) and Poa (the more local word for hakuna matata). Swahili sure seems like a fun language to learn! What’s the most beautiful beach you’ve set foot on? Join The Shooting Star on Facebook, Twitter and Instagram for more offbeat places around the world. Thank you for sharing this post with amazing photos. Hope you make it someday! These photos are stunningly beautiful! Thanks for sharing! Amazing.. now it is in dream list. That totally unexpected view of Mount Kilamanjaro was such a treat! Gorgeous photos Shivya. This just went on the bucket list! Hi dii, The post was siper awesome. I loved the different shades of blue, the angles while clicking, and off course the poem that flowed with the pictures. Thanks for amazing info regarding the place and how to visit it. All the best for other travels. cool, I wonder how this compares to untouched beaches in the Phillippines! I’ve only been to a few beaches in the Philippines (not really the untouched ones) – but gorgeous though they were, they don’t compare! Thanks for your comments, Shivya! A wonderful account of such a lesser-known destination. Look forward to reading more of your exploits. Can we get a link to your blog on our website? This is so great! I’ve never wanted to go to Tanzania more than right now! A poetic post. Photos are beautiful. Shades of blue seen everywhere is so soothing. Thanks for sharing. Beautiful pictures!!! Your narrative about the place in contrast with the photos is awesome. Thanks for sharing this wonderful experience. Zanzibar is a dream.I’m even so close to it here is South Africa. After reading this post i feel more motivated to go even before the end of this year. Even if its just for a quick visit.Ill just do everything you did here.. lol. I’m new to your blog and loving it so far 🙂 Have you ever visited South Africa? Absolutely stunning! The beaches of Africa seem so alluring because the focus is just not on them! Wow! Zanzibar looks so much like the Carribean in your photos! beautiful photos and nice poem to go along with them. I’m in Turkey now, headed to Tanzania for a photo safari tomorrow. I’ve been thinking of going to Zanzibar after, but not sure where to go or how. Did you visit Stone Town? Any other suggestions for things to do in Zanzibar? I’d like to find a place I can snorkel right from the beach and also do some SCUBA diving. Amazing shot of Kilimanjaro…although there’s almost no snow left on top now! I visited Paje beach in Zanzibar. Absolutely stunning. Unsubscribe me from this comment thread please. I cantt find the link to unsubscribe myself in these email. thank you. You can find the unsubscribe link at the bottom of the email. Wow the post about Zanzibar is very beautiful. It is one of the dream destintion in the World. Previous PostHow I Manage Visas on My Indian Passport As I Travel Around the Globe. Next PostWhy North Wales Blew My Mind.